Natural substances are great sources of a lot of different healthy nutrients. Of course, there are so many substances and so many nutrients out there that it’s a bit difficult (or nearly impossible) to know everything there is to know about every one of them. Knowing a little bit about most of them, however, is the best way to make educated decisions regarding which natural substances you should add to your diet. By understanding each of the nutrients your body needs, you can make healthier choices concerning what you decide to put in your body. The omega nutrients are quite popularly discussed, but only certain types are well-known. For example, you may have heard about the omega 3, which is most commonly found in salmon, as well as some other healthy superfoods. With that said, you might not actually know much about what omega 3 can do for your body. Now we have another omega acid which has come to the fore – omega 7. While there are many types of omega 7s, palmitoleic acid seems to be getting the most attention out of them all. Generally speaking, however, omega 7s are becoming known for their abilities to reduce the risk of heart disease, as well as type II diabetes and other diseases related to obesity. When people talk about omega 7s, however, they are likely referring to the popular palmitoleic acid, so that’s the fatty acid we will be focusing on today. As are the other omega nutrients, palmitoleic is an unsaturated fat. These fats promote a healthier heart, mostly thanks to their positive benefits of balancing cholesterol levels. Unsaturated fats are typically found the most in plant sources, like nuts, seeds, and vegetable oils. On the other hand, saturated fats tend to be considered “unhealthy”, as they may raise bad cholesterol levels, cause internal inflammation, and increase the risk of heart disease. These negative results may only truly be a factor, however, if the balance of unsaturated to saturated fats is uneven and leans more toward the side of saturated fats. Essential fatty acids are fats the body cannot produce on its own, which means you need to get these nutrients from outside sources. With that said, palmitoleic acid is actually not an essential fatty acid; our bodies can produce it with the help of other nutrients. With that said, the compound is not quite as abundant as other omega nutrients are in the typical daily diet. Some notable sources of palmitoleic acid are macadamia nuts, fish, and sea buckthorn oil. Until recently, omega 7s were not the subject of much scientific focus. However, interest in the health benefits of fatty acids has been growing and scientists are beginning to look into the world of omega 7s and other healthy fats. It has been said that there may be around 150 fatty acids for scientists to explore, and each one of those fatty acids has their own functions and benefits for the human body. They also stated that palmitoleic acid also acted as a hormone within the body, which made it the first fatty acid of its kind, Because it was the first, the researchers of that study created the term “lipokine” to refer to the new class of hormones or fats. The discovery of this new type of hormone was very interesting, considering that all other hormones up to that point were either proteins or steroids. A Japanese study was performed to show the effects palmitoleic acid had in the body regarding metabolic processes in relation to diseases related to obesity. They found that mice with diabetes actually gained less weight after being fed palmitoleic acid for a period of four weeks, in comparison to diabetic mice who were fed a placebo substance. There haven’t been many studies on humans regarding the effects of palmitoleic acids, but most of the existing ones have shown similar findings to the Japanese study with mice. Similar to the mice, people who had high levels of palmitoleic acid in their blood were generally shown to also be more sensitive to insulin and have a better balance of cholesterol levels. However, not all of the studies have shown positive effects, some including a higher body mass index, higher levels of triglycerides, as well as an increased risk of heart failure. With that said, these studies are difficult to count as absolute fact because they only show a potential correlation, not a direct cause and effect; as more studies are done, we may learn more about the acid’s effects on humans. Of the studies that have been performed regarding the benefits of omega 7s, whether they be human or animal studies, there have been many health benefits proven to be provided by the fatty acid. One major benefit is the nutrient’s ability to balance the levels of bad cholesterol in the body, which can help encourage a healthy heart and reduce the risk of developing various cardiovascular diseases. It also boosts the levels of good cholesterol, which helps to balance out and efficiently eliminate bad cholesterol levels at the same time. Omega 7s have also been shown to help balance the levels of triglycerides in the body. Triglycerides are important for providing energy and insulation, especially in colder temperatures. If these levels become too high, you may be at an increased risk of developing heart conditions and hepatic fat accumulations, which could cause diabetes. The fatty acid in question may also help balance and maintain normal levels of c-reactive protein. C-reactive protein is related to inflammations and related disorders or diseases. Inflammation itself is actually very healthy, as it can help your body heal. It’s when there are abnormalities and imbalances that inflammation becomes a problem, leading to chronic inflammatory disorders such as multiple sclerosis, rheumatoid arthritis, type I diabetes, psoriasis, Alzheimer’s, and many others. According to researcher, these reductions can also reduce the risk of cardiovascular disease along with the potential risk of many other inflammatory illnesses. Other benefits of omega 7 and palmitoleic acid include appetite control and an increased production of energy. Several research studies have shown that omega 7 helps the performance of leptin, which is a hormone that makes you feel full. The palmitoleic acid may also help improve the functions of your bowels and keep you from gaining too much-unwanted weight. The benefit of increased energy comes from the nutrient’s ability to convert calories into energy instead of fat. Studies have shown that omega 7 moderates and balances de novo lipogenesis while increasing the oxidation of fatty acids. It encourages fatty acids to be expended as energy instead of being stored in the body as fat. To put it simply, omega 7 provides a healthy boost to your metabolism, which helps your body burn calories faster than the calories are able to be stored as fat. Healthy people have a natural sensitivity to insulin which is a hormone produced in the pancreas, The hormone tells the body to store glucose or sugar for use when necessary, It also helps properly regulate blood sugar levels meaning they do not get dangerously high or too low. People with insulin resistance are far more susceptible to developing type 2 diabetes and also more at risk of heart disease, kidney disease and obesity. Studies have found that omega 7 fatty acid helps to promote proper insulin sensitivity allowing the body to metabolize glucose the way it should. Omega 7 fatty acids may also play a role in better digestive health and relieve common gastrointestinal issues like gastric ulcers, heartburn and acid reflux. Omega 7 fats can build up and line the intestines protecting them from damage and potential disease. Omega 7 supplements may therefore benefit people who are suffering from gastric ulcers or people plagued by GERD or heartburn. As well as its many benefits for internal health, omega 7 may also help nourish your skin and treat a range of common skin complaints. Omega 7 supplements are a great source of antioxidants and other nutrients that can protect your skin from damage and revers many of the signs of aging. Omega 7 can also boost your production of collagen which helps strengthen the skin giving it a more healthy and firm appearance. The anti-inflammatory properties found in omega 7 may also help treat inflammatory skin conditions like psoriasis and eczema and may even help speed up recovery following wounds, burns and other skin damage. What does Omega 7 do for you? Research is at a very early stage but the signs so far are very promising and it would appear that omega-7 fatty acids have a number of potential health benefits. Studies done to date indicate that omega-7 can confer heart health benefits, reduce cholesterol, protect against diabetes, obesity and metabolic syndrome. These fatty acids may also help nourish and strengthen your skin and could have digestive health benefits. What foods are high in Omega 7? 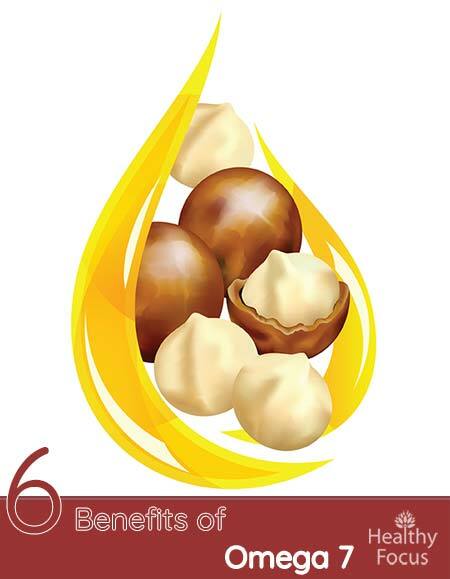 When it comes to omega-7 fatty acid, the one which is creating the most interest is palmitoleic acid. There are actually very few food sources of palmitoleic acid which is why many people are choosing to supplement. However, it can be found in fatty cold water fish such as salmon, mackerel, trout, sardines and tuna. It can also be found in macadamia nuts and in a fruit known as sea buckthorn berries or sea buckthorn oil. According to the research done to date, there is very little risk in taking omega 7 supplements in the appropriate dose. While palmitoleic acid is considered to be very beneficial, there is some doubt over the effects of palmitic acid. Palmitic acid is a saturated fat and may cause certain unwanted side effects in very high doses. We already get plenty of palmitic acid in our diets through cheese, ice cream and meat. Because of the fact that there has been little research so far into the effects of omega 7s and palmitoleic acid, scientists have advised against rushing into taking omega 7 supplements. Another reason that scientists are currently hesitant about the use of omega 7 supplements is the fact that palmitoleic acid always occurs in unison with palmitic acid, which is a saturated fat that most scientists have labeled as unhealthy. We already have high amounts of palmitic acid elsewhere in the body, in foods like ice cream, chocolate, cheese, and meat. If the levels of palmitic acid present in the body are too high, there may be serious negative effects. Too much palmitic acid could contribute to the deterioration and destruction of pancreatic beta cells, which produce insulin. It has also been noted that palmitic acid may keep you from feeling full when you’ve actually eaten enough. This could lead to weight gain caused by overeating. With that said, there are some omega 7 supplements that have undergone purification to remove palmitic acid. While it is usually not a good idea to seek supplements and natural substances that have gone through any kind of altering process, a purified Omega 7 supplement may be better than one that contains high amounts of palmitic acid, for the reasons mentioned previously. You can find these altered supplements under the labels of “Palmitic Acid-Free” or “Purified Omega 7”. Even with the risks of palmitic acid, however, there are still many health benefits that have been proven to be associated with this healthy fatty acid nutrient. Keeping all of this in mind, it’s best that you simply be careful and take things slow when adding an omega 7 supplement into your diet. You may also wish to speak with your doctor before using a supplement like this. When referring to the health benefits of omega 7 we are usually talking about palmitoleic acid. Studies done to date have been promising. It appears to have a beneficial effect on the heart, cholesterol levels, and the weight and may also reduce the risk of diabetes and metabolic syndrome. Palmitoleic acid is not easy to attain from natural food sources and many people choose to take a dietary supplement. Speak to a nutritionist or your doctor to find out if you can benefit from taking an omega 7 supplement. If you already take omega 7 please let us know how they have worked for you.